Patron Technology CEO, Eugene Carr, is the featured speaker at this week's First Annual Conference of Arts Marketing in Madrid, Spain. Eugene Carr, Patron Technology founder and CEO as well as the co-author of Breaking the Fifth Wall: Rethinking Arts Marketing for the 21st Century, is a featured speaker at this week’s I Conferencia Annual de Marketing De Las Artes (the First Annual Conference of Arts Marketing) in Madrid, Spain. Carr will speak on how the adoption of CRM (customer relationship management) systems is causing a revolution in the world of arts and culture. The two-day conference, October 10th and 11th, brings together cultural industry leaders from Europe and the U.S., who will discuss ways to improve the connection between cultural organizations and the public. In addition to Carr, speakers include Brian McMaster, former Director of the Edinburgh International Festival; Gerald Mortier, Artistic Director of Teatro Real; Hannah Rudman, Special Advisor to the Scottish Arts Council; David Brownlee, Executive Director of UK Audiences; Pepe Zapata, Director of Communication of the Flors Mercat; Miguel Martin, Director of the Heineken Jazz Festival; and Chris Denton, Director of Marketing of the Barbican Centre. 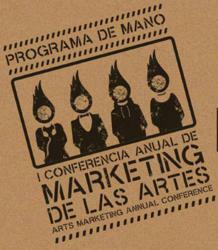 Carr will speak at 3:30 p.m. on Tuesday, October 11th, the closing day of I Conferencia Annual de Marketing De Las Artes, at the Fundación Lázaro Galdiano, Calle Serrano 122, Madrid. ABOUT EUGENE CARR: Eugene Carr, founder and CEO of Patron Technology, has been an innovator in the area of e-marketing for arts organizations for 15 years. In 1996, AOL invested in his first Internet company, CultureFinder.com, which became an award-winning nationwide arts calendar and online ticketing service. In 2001, Gene founded Patron Technology, and its PatronMail is used by more than 1,800 institutions in all 50 states and eight foreign countries. PatronManager CRM, launched in June 2010, is an all-in-one web-based system built in partnership with salesforce.com and the Salesforce Foundation that combines ticketing, subscriptions, fundraising, e-mail marketing, and staff collaboration. Gene’s latest book, Breaking the Fifth Wall: Rethinking Arts Marketing for the 21st Century, was published in April 2011. He also writes the popular blog: Wired for Culture. ABOUT PATRON TECHNOLOGY:Patron Technology strives to revolutionize the arts industry by offering world-class customer relationship management (CRM) and e-mail marketing technology at a price that every organization can afford. Founded in 2001 by Eugene Carr, the New York City-based company is the leader in e-marketing technology for arts and non-profit organizations. The company’s PatronMail e-mail service is used by over 1,800 arts and cultural clients in all 50 states and eight countries overseas. Patron Technology is dedicated to educating the non-profit community about e-marketing. In the spring of 2011, Eugene Carr (CEO) and Michelle Paul (Product Manager) co-authored and published the book Breaking the Fifth Wall: Rethinking Arts Marketing for the 21st Century. In addition, the company presents a regular schedule of live e-marketing seminars across the country, monthly e-mail newsletters, blogs, and live educational webinars. ABOUT PATRONMANAGER CRM: PatronManager CRM, launched in 2010, was developed in partnership with salesforce.com and the Salesforce Foundation. PatronManager is a 100% cloud-based system that integrates box office services, fundraising, e-mail marketing, and staff collaboration, enabling organizations to put all their vital customer information in one place, accessible by the entire staff. With PatronManager CRM, organizations can sell more tickets, target their marketing and fundraising efforts more effectively, provide better customer service at the box office and beyond, and make their organization more efficient.